“Prayer For The Dying” is all about the build. It builds to the horror of not one, but two tragic deaths. It builds to the merge ceremony the show has been teasing all season. It builds, builds, builds, and then once it gets there doesn’t quite know what to do with what its built, leaving both climaxes to sort of trail off, with threads that promise dividends in the future but don’t quite come together in this episode. It’s not bad, just a bit disappointing, as these two stories in one episode feel like they could have been so much more. Once Liz is free of magic and in no danger of dying because of Caroline’s blood, things get tricky when the siphoning spell causes Liz to go into cardiac arrest and she dies on the table. The death scene itself is very well done, clinical and stark and sad, but what surrounds the death scene took a bit away from its overall impact. The flashes to Liz’s subconscious saying goodbye to Caroline were meant to be incredibly sad, but instead they almost distracted from the actual sadness of her death. What did work, though, were Liz’s moments with both Caroline and Stefan after she came back to life, as she begins the process of saying goodbye and preparing Caroline to be without her. Marguerite MacIntyre has always been sparingly used but great when she gets the chance, and she’s predictably great here. Knowing you will die and your child will live forever without you is hard. Facing that death when you thought you’d have at least 40 more years to spend together is unimaginable, and MacIntyre makes Liz’s pain at this realization palpable. Liz’s death was intercut with the twin merge, which finally happens after weeks of really twisted Gemini Coven backstory leading up to it. Intercutting the two is designed to elevate the power of both—and it does in the moments leading up to the climax—but after the climax it feels like more of a sputter than anything else, mostly due to the merge story. The main downfall of the twin merge is that once Luke stepped in for Joe, its outcome was never really in doubt. The show has ignored Luke for the better part of this season while elevating Liv and Jo’s importance, and then spent the last few episodes building up Luke’s insistence that he not kill Liv by merging with her. Once Luke attempted to merge with Kai, there was no way he was going to be the winner; on The Vampire Diaries, the snarkiest always wins, and the snarkiest will always be Kai. It doesn’t help that the ceremony itself was pretty darn boring, just a bunch of hand-holding and a bit of strong wind, punctuated by someone waking up. Not the most exciting magic the show has ever seen. But the merge ceremony isn’t the endgame for this story; it’s what happens after the merge that matters. Kai was already insanely powerful before the merge, as witnessed in the last episode. If the gang couldn’t stop him then, what will they do when he’s three times as powerful? Seems like a job for the intrepid Bonnie Bennett, who’s currently very busy being trapped in an alternate dimension. I had hoped everyone would want to get her home when they didn’t immediately need a favor from her, but who are we kidding? This is TVD and this is Bonnie, TVD’s ultimate utility tool, after all. I just hope she returns soon because her energy has been missed in these past two episodes, and being able to say that is maybe season six’s greatest gift of all. If Kai can siphon all the magic out of Liz, can he siphon all the magic out of a vampire and kill them by turning them human again (and therefore making them succumb to whatever originally killed them)? The magic on this show always leaves me with so many questions. Did they explain how Colin the cancer vamp knew where to find Caroline? 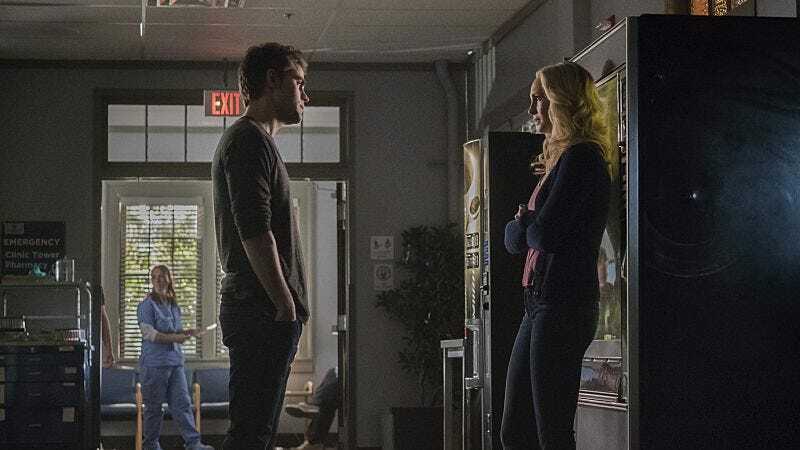 Caroline ignoring her mother because she didn’t know how to face her felt slightly out of character for Caroline, and Stefan having been in the exact same situation with his own mother felt a bit too pat. Still, it’s nice to get the friendly moments between Stefan and Caroline after they spent most of the season hating each other. 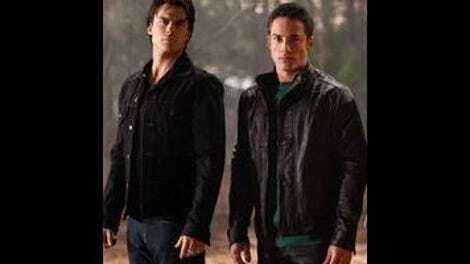 Damon and Elena are back together, I guess. Elena was very good at making Liz’s death all about her! This week, in Matt Donovan Is The Best: Matt wasn’t in this episode, but I like to picture him working at the Mystic Grill, looking outside and thinking “Huh. Kind of windy tonight!” and shrugging. “I know this little Italian joint that has eggplant so good, you’ll think you’re eating people.” Vampire humor! “I could kiss you, you beautiful moron.” I have a feeling Tyler gets that a lot.